"I have no interest in ordinary humans. If there are any aliens, time travellers, espers or dimension sliders out there, come find me!" Not your typical high school introduction, but in the eyes of Haruhi Suzumiya, nothing less would have sufficed. Brave souls who tried talking to Haruhi were met with a simple 'not worth my attention'. Excelling in class, sports and with good looks to boot, she should have been a popular girl surrounded by fans. Yet her spiteful you-are-ordinary attitude, nurtured since she was in middle school, drove everyone away. So beneath her attention were ordinary humans that she didn't care boys were still around when it was time to get changed for PE classes, but somehow, the words of her extraordinarily ordinary classmate Kyon managed to captivate her interest. In fact, he ended up 'unleashing' the ever-discontent Haruhi, suggesting she make her own club when she couldn’t find a worthy one to join. Haruhi was quick to take action. A club room was illegally secured and members were kidnapped and conscripted. Satisfied with numbers, Haruhi named the club that was to start 'legends' at school: "Saving the world by Overloading it with fun - Suzumiya Haruhi's Brigade" (SOS-dan). The high publicity stunts pulled under Haruhi's direction is but only a small fraction of its activities though. The SOS-dan follow their brigade leader's whims to seek out the supernatural or create and enjoy some unconventional situation. Haruhi's indomitable will cares not for society's opinions or morals, so why exactly do the other members follow her? Truth is, she herself is the supernatural phenomenon she's been searching ever so hard for. The 3 conscripts (not counting Kyon) she grabbed turned out to be representatives of three distinct factions - An alien faction, a Time traveler faction and an ESPer faction. Each has their own theory of what Haruhi is: for the Aliens, she is a solution to the evolutionary dead-end that they have hit; to the time travellers, a time-quake that needs to be guided; and to the ESPers, a whimsical "God" who can create or destroy the world at will. Haruhi's common sense conflicts with her desires, resulting in these factions being attracted to her but remaining hidden in plain sight from her own view. The keen mind she has will always fail to pick up on the truly supernatural things happening all around her as she searches for them. As time goes by, Haruhi starts to loosen up. She gets conscious of Kyon being a boy when she changes clothes. She helps out a troubled group of 'ordinary' students. Her adamant will sometimes makes compromises. The obsession to find supernatural begins to mellow out into enjoying life in a unique and unconventional way. Sometimes even extraordinary things reach new heights, but it seems that despite her popularity in a different dimension, Haruh still has yet to win a Saimoé crown. Upon entry to 2006, Haruhi was expected to virtually win a crown in the Saimoe circuit. She did well in Korea Best Moe - after defeating Eruruu (Utawarerumono), she then went on to dominate against Sugintou, a Rozen Maiden representative, but a narrow 12-point victory over fellow S.O.S. Brigade member Yuki Nagato in the round of 8 led to an 11-point loss to Eri Sawachika (School Rumble), an ordinary human at that, in the semi-finals, resulting in an impressive third place finish. This landed her in the radar as the favorite to win in Japan. However, the randomized bracket led Haruhi, who dominated the first two rounds, to a rematch with Yuki in the round of 32. After losing by 100 votes in a 2000 vote match, Haruhi finished Saimoé Japan a dismal 21st. Because Suzumiya Haruhi no Yuuutsu was not shown in 2007, Haruhi took a one-year hiatus as new names started to emerge, and old names gained more recognition. She was invited to return for Korea's Super Best Moe 2006-07 thanks to her impressive third place finish from the previous year. After finding victory against difficult names in the preliminaries such as Nanoha Takamachi (Nanoha), Maria (Hayate no Gotoku), and Kagami Hiiragi (Lucky Star), Haruhi persevered the knockout rounds with ease, defeating Mai Kawasumi (Kanon) and Teletha Testarossa (Full Metal Panic) respectively to reach the semi-finals. However, the semi-finals found Haruhi paired with Yuki for a third tournament, and Yuki had the momentum to reach the finals with ease, more so than Haruhi. The close match ended with Haruhi barely scraping by by only fifteen votes. Although Haruhi exceeded her previous effort in Korea Best Moe 2006, her momentum was shaken, and her final match against Shana (Shakugan no Shana), the one contestant with even more momentum than Yuki, resulted in a 17 vote loss. Haruhi finished second in Korea's Super Best Moe 2006-07. With a second season slated to air this year, Haruhi is expected to return for the full 2008 Saimoe circuit. However, she enters this tournament as one of the many who have not won a Saimoe crown. 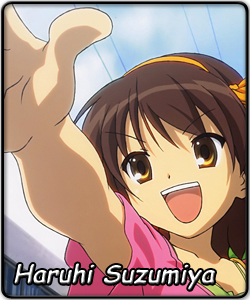 With a legion of Haruhists behind her, Haruhi Suzumiya expects to make a huge impact in the International Saimoe League.